Gunsmithing The 2nd Amendment & What To Stock Up On. This week on the Gunmetal Armory, the Mistress of Metal will be joining me. We are going to be giving away one of the nicest prizes ever on the show Thursday night. 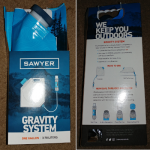 It is the Sawyer Gravity Feed Water Filter System. We will choose one lucky winner to receive this awesome piece of prepper gear. Then, we are going to rush head first into the FULL and TRUTHFUL definition of the 2nd Amendment. And we will discuss what it does mean, and what it should mean to us as gun owners. Listen to this broadcast or download “Gunsmithing The 2nd Amendment & What To Stock ” in player below! After that, we are going to tackle an interesting subject from the standpoint of a gunsmith, gun lover, and someone who works hand in hand with the gun industry. From that perspective, we will dive into what items you may want to start buying, what ones you need more of, and what items you’ll want to stockpile like its gonna be a long winter. So join for this show in player above for The Gunmetal Armory, on The Prepper Broadcasting Network. Previous: Previous post: Understanding and Mastering the Bugout!